Have you been trying to create the perfect farmhouse style in your home? 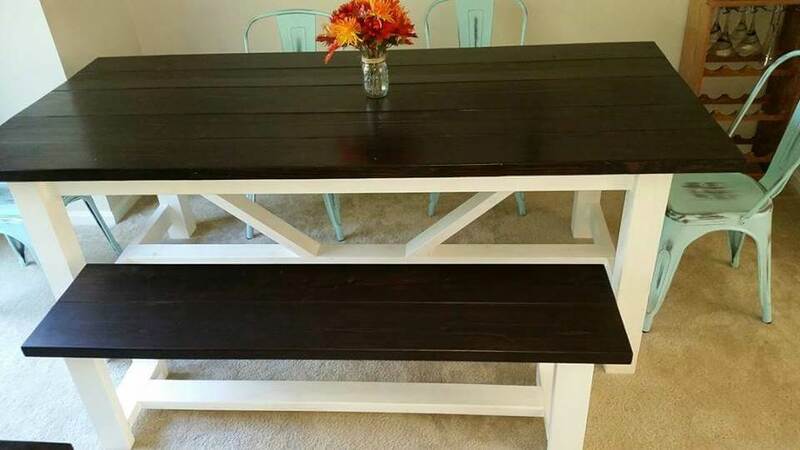 How would you like to build your own 7’ DIY Farmhouse Table? Well, we did and we want to show you how to build your own too. 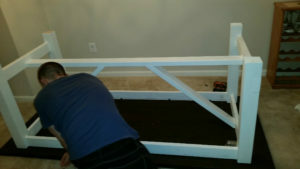 This project is a lot easier than you would think and can be accomplished with a few tools and a little determination. We built this while we lived in DC and didn’t have any room. It was completed in our tiny backyard and in our basement. The total cost for this farmhouse table was under $200, which is a great price when compared to buying one. 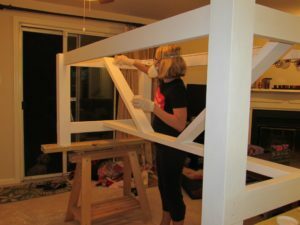 We got the idea for the base of our farmhouse table from Ana White but modified it slightly to fit our house. The table is made out of stock lumber that you can find at any local lumber store. We got ours at home depot. Let’s get into it, here is the step-by-step process for completing this table. This is the length of cuts we made. I recommend cutting the boards as you go so you can adjust as necessary. It might save you an extra trip to Home Depot. The first thing you are going to need to do is to get all of the supplies. Take the lists above and make sure you have everything you will need for this project. We had all the tools necessary so our trip to Home Depot was just for materials. Building the table top is fairly simple. For this step, you will use the 2×8’s and the 2×10. Cut each of the boards to 84″ long. I highly recommend sanding and staining the boards before you screw them together. Now that the boards are cut lay them on a flat surface with the bottom side of the table top facing up. Put the 2×10 board in the middle and two of each of the 2x8s on both sides making sure they are all lined up. Lay all the boards together and determine where you will drill your pocket holes. The handheld Kreg Jig is awesome and works great for drilling pocket holes. Drill the pocket holes so that each board will be connected to the adjacent board by at least 6 screws. We alternated the side that the pocket holes were drilled on so that the screws would pull the boards together in both directions. Use 2.5″ pocket hole screws to connect the boards. Once they are connected your table top is assembled. In order to make the table sturdy, we wanted to use 4×4 posts for the legs. Those boards support decks so we figured they would work great for our farmhouse table too. Take your two 4×4 posts and cut them down into 4 pieces that are 29 inches long. Now measure up 6 inches from the bottom of each leg and make a pencil mark. This is where you will cut the notch for the 2×4 cross beams. Going up from that mark you will need to cut out a notch that is 1.5” deep and 3.5” high. Try to keep this one snug so take your time. I ran the 4×4 posts through the table saw to make a bunch of little notches in the wood. After that, I was able to knock them out with a screwdriver and small putty knife. These cuts can also be done with a circular saw but is a little more dangerous that way. Repeat this step with all four posts and remember to take your time. 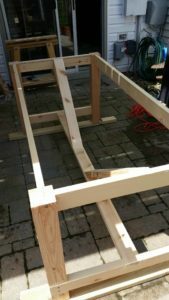 Once the legs are cut you want to start putting the framework for your farmhouse table together. 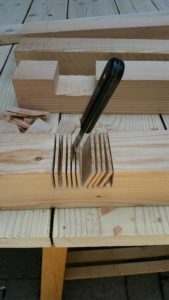 First, cut the 2×4’s that will connect the legs together. Cut these boards to 34” long. In the center of those boards, you need to cut a groove for a 2×4. Using the same method as when we cut the legs, cut out notches for a cross board. Center this notch on the 2×4’s. With the notches cut and the boards at 34” long you can screw them to the legs. We used 2” black wood screws for this and screwed them inside by side into the 4×4. Screw the 2×4’s to the 4×4’s exactly the same all the way around for a uniform look. With the two end pieces screwed together, it’s time to connect them. Cut a 2×4 down to 73” and lay it in the grooves you cut out earlier. Again you will want to screw these together with a 2” wood screw. Make sure you screw these boards together from the bottom. At this point, the base is starting to take shape. During this step, we will cut out the framework that will attach the table top to the base. For this step, you will need to cut one of the 5/4×4” boards to 27” and 66” long pieces. 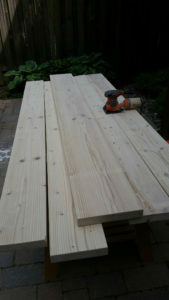 With the first board cut to length, cut the other board to the same lengths. On each end of these boards, you need to drill 2 pocket holes. The pocket holes should be drilled on the inside of the frame and are used to secure the top of the table frame to the legs. With the boards cut and the pocket holes drilled you now need to take each of these boards and run them through the table saw to make a groove. This groove will be how you connect the table top to the frame. To cut the groove properly, you need to measure your z-clips and see how far down and in you need to cut them. The groove on our table was about 1/4” down from the top of each board and about 3/8” deep. Set your table saw blade to the depth and distance from the gate in order to make the perfect cut. Don’t cut all the way through or you will be quite unhappy. With the grooves cut you can now screw these boards to the table legs using 2.5” pocket screws. Make sure the boards are flush with the top of the legs and are all set in about 1/2”. You might be asking why can’t we just screw the table top to the table frame? What are these stupid z-clips you keep talking about? The z-clips are little metal tabs that are in the shape of a flattened Z. One side gets screwed to the table top and the other side goes in the groove you just cut. This allows the wood to expand and contract as humidity levels changes in the air. If you screwed the table top directly to the frame you risk breaking things as the wood moves. This step isn’t necessary but gives the table a cool look when finished. You will need to cut the remaining 2×4’s with angles on each end and screw them to the frame. The angle at which you cut each end is determined by the placement of the boards. We had ours run from the top of the end frame down to the center cross beam. There was about a 10-inch gap between the two on that board. Unless you are super good at math and calculating angles (we are not) cut the board a little long and adjust the angles until you get it right. David is pretty good at eyeballing it to get real close. Just play around with it until you get it right. When you get to the point of screwing the angle beam on, make sure to screw the top so that it is hidden and screw the bottom from the underside. This gives the farmhouse table a better and cleaner look. With the farmhouse table frame and tabletop put together, it’s time to start the finishing touches. To get a nice smooth finish on the whole table we always start by sanding with 150 grit paper. Then we work our way through 200 grit and finish with 400 grit sandpaper. We like how smooth of a finish that gets us. If you didn’t sand and stain the table top before you put it together, now is the time to do that. We went with the Kona finish from Varathane and really like it. Once all the sanding is finished you can start painting the base. We used white chalk paint and we were really happy with the look. The table top received 3 coats of Polyurethane to protect it. The last thing you will need to do is attach your table top to the table base. I highly recommend moving your table into place and attaching the top there. It will be a lot easier and lighter to move with the top not attached. If you follow these steps you should be able to build that Farmhouse Table you always wanted. The best part about this is when your friends come over and ask where you bought your gorgeous table, you can tell them you built it!! This is a project that is so much fun and you can get the whole family involved (yes, even our 3-year-old Savannah got to help out). We would love to see how your Farmhouse Table builds go. Feel free to share pictures or ask any questions you might have.